Most tourists travel through space. Dheera Venkatraman also travels through time. Enamored by photographs taken in China a century ago, Venkatraman has traveled across the country by train, taking photos in the same places as the historic images, comparing the past with the present in an ongoing project, Time Traveling in China. "I like to do what others don't do so that I have something new to share with the world when I come back, instead of taking the same set of pictures everyone else does," he said. The 31-year-old has a doctorate in electrical engineering from Massachusetts Institute of Technology and co-founded a startup, Robby Technologies, that develops autonomous delivery robots. His professional interests have informed his photography. "Having studied physics before, it was only natural to also think of traveling in time instead of space. So that's what I did here this time," Venkatraman said. Among the 12 cities he has visited so far, he found Pudong New Area in Shanghai had changed most significantly. "Most people know that the city of Shanghai is a fairly recent development in Chinese history, but to see it in pictures is even more mind-blowing," he said. Lanzhou, the capital of Gansu province, especially impressed him, as the city is unrecognizable from its old images, except for the mountains and river. 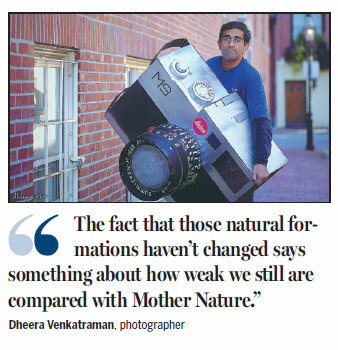 "The fact that those natural formations haven't changed says something about how weak we still are compared with Mother Nature," Venkatraman said. The Customs House in Wuhan, in central Hubei province, may be more typical of what he found in his travels. The area has experienced a transition from horses to buses and cars, "and that same building probably will see the transition to automated driverless cars, drones, and other new forms of mobility in the next 100 years," he said. The project has been challenging as there are new obstacles and buildings that prevented easy access to the sites in the old photos or prohibited him from approaching from the right angles. "I had a success rate of probably around 20 percent. There were many, many failed shots simply because I couldn't get the right angle," he said. 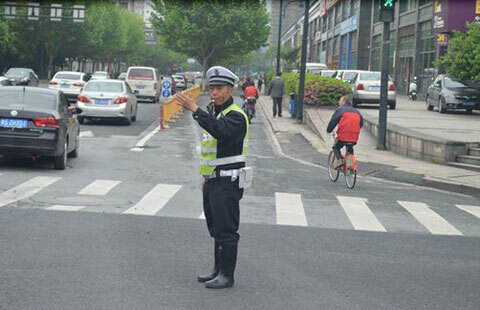 Among his numerous travels in China, he once bicycled nearly the entire 1,600 km along the Beijing-Hangzhou Grand Canal from Beijing to Hangzhou,Zhejiang province. He plans to photograph more northern cities for the Time Traveling in China series in the future as he didn't have much success in them during the smoggy winter. Having grown up "moving around the world", Venkatraman considers himself a global citizen. "I don't think of the world in terms of countries, and have no sense of identity that is based on a geographic or political boundary. My only sense of identity is in culture, arts and science," said Venkatraman, who speaks and writes in Chinese and was the technology director for the MIT-China Innovation and Entrepreneurship Forum from 2011 to 2012.